When you go to the gym, you aren’t supposed to relax too much. Also you’re meant to avoid getting distracted by people and things, and are not technically supposed to use your noggin to use the leg machines. 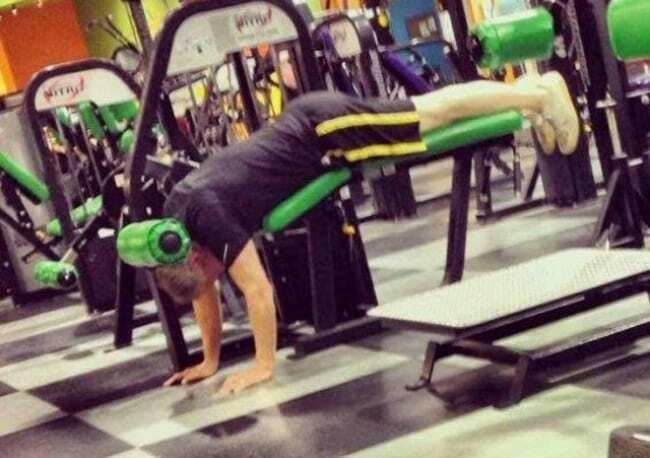 However, as these 19 gym fails show, there’s a wide range of styles at the local gym. This makes perfect sense to some people. 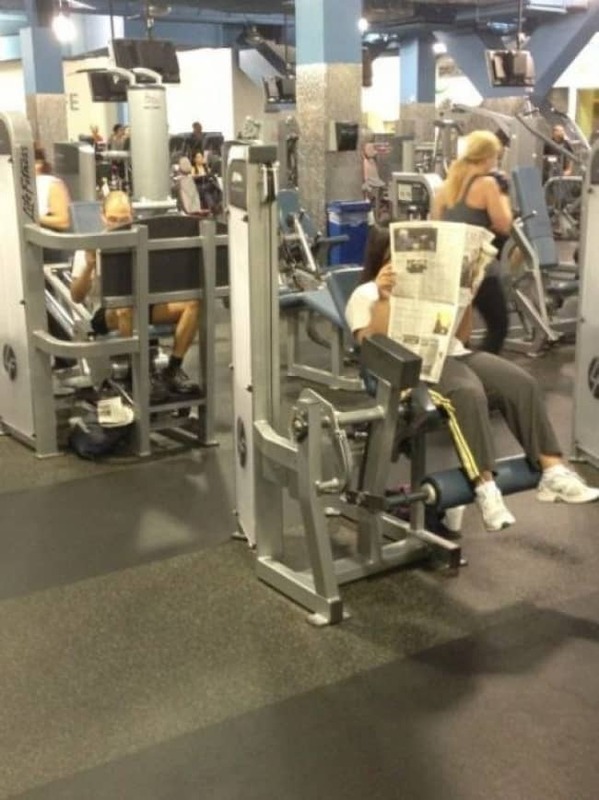 You may laugh but most people at the gym spend a lot of time staring at their phones. In fact they spend more time texting and reading than they do lifting weights. Did she forget her phone, or is she a committed luddite? Ok wait. This guy has his computer on the bike? And he has what appears to be a Starbucks iced coffee? This is many times worse than the lady reading the newspaper. I was once told by a trainer that if I was able to read while biking that I wasn’t pedaling fast enough. If you’re so busy you need to bring the computer, maybe you should’ve stayed in the office! This is probably not about proper form. It’s also probably not some advanced “wax on, wax off,” technique developed by Mr. Myagi. Our best guess about what’s happening here is not fit for G rated sites. We’ll just point out that this might result in a pretty serious back injury! 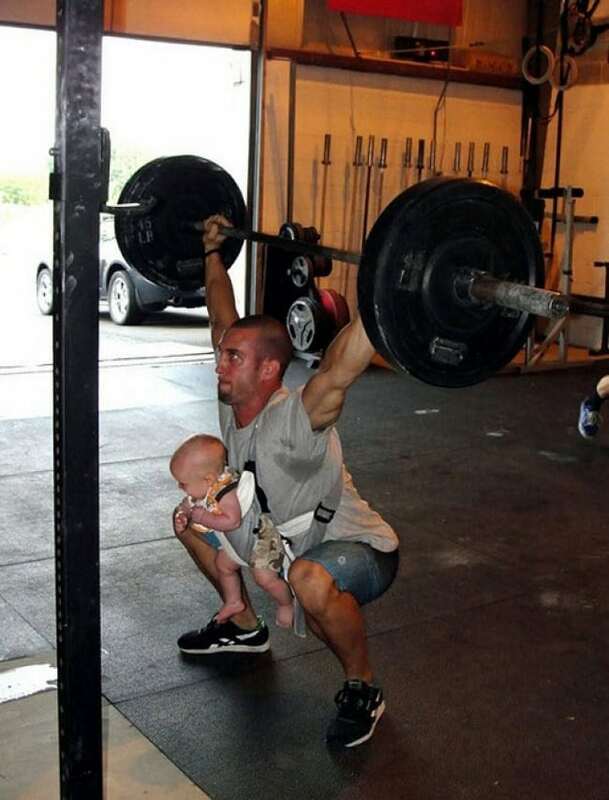 The purpose of having a spotter is safety. That way if you need assistance, someone can step in and safely lift the weight from your chest. All that works well until something else catches your spotter’s eye, which is what happened here. Can we petition the internet to get rid of that “girl watches guy watch girl” meme and replace it with this one? I’m not sure how to feel about this: terrified or impressed. On the one hand, he’s lifting an awfully impressive amount of weight. Just look at those legs! What a committed dad! On the other hand ohmygodhehasababystrappedtohischest!!!! On second thought, terrified is definitely the right emotion. From Supergirl to the Flash, it always seems like superheroes get their super speed naturally. Batman shows us this isn’t true. He’s slogging it out on the treadmill like the rest of us. 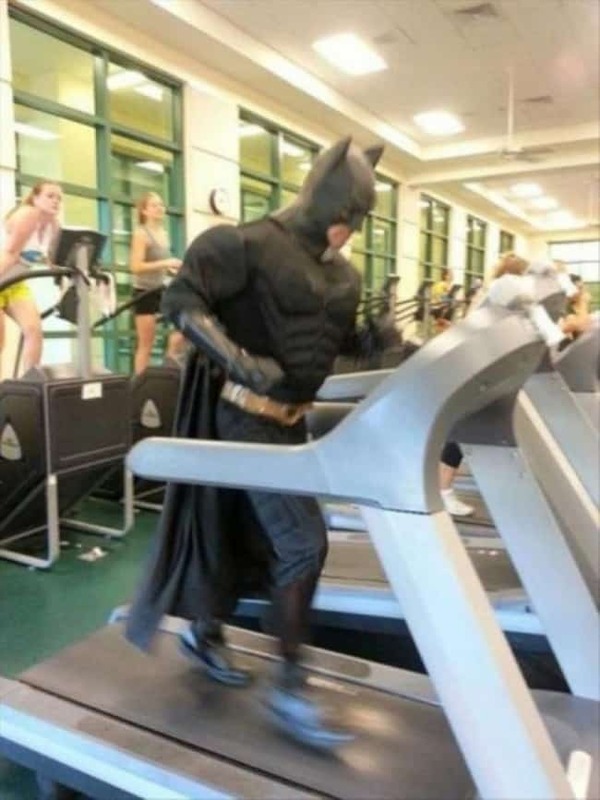 Makes me thankful I don’t have quite enough super powers to be forced to exercise in a mask and rubber suit. 11. 911, What’s Your Emergency? 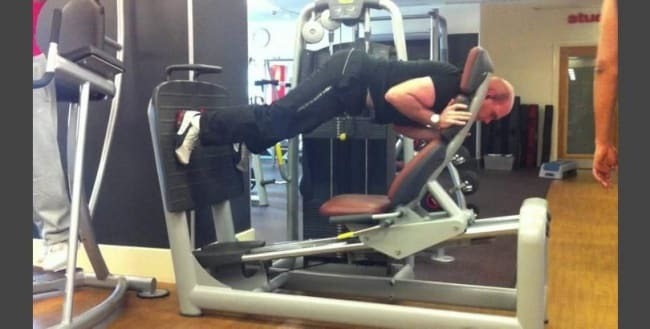 Look, I don’t know about you, but I always try to use the leg machine by turning upside down and wedging my head through the chair. How many seconds do you think he did this before someone had to call an ambulance? I was a band geek, and I didn’t think there was much worse than “band training camp” which took place in the 95 degree Florida sun. 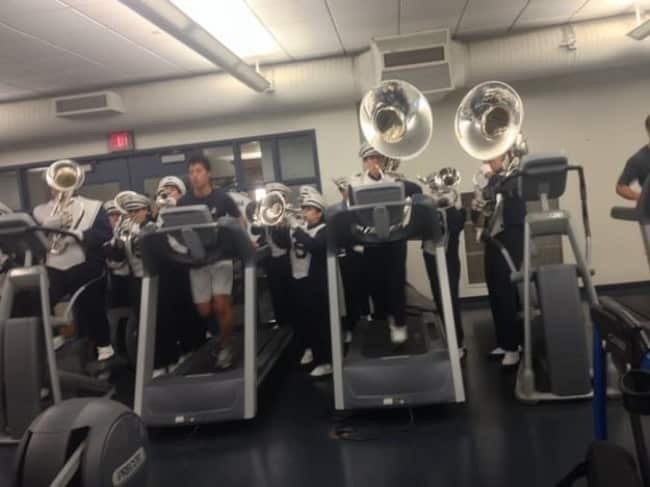 Now that I’ve seen these poor kids wearing band uniforms on the treadmill, I know it could’ve been much, much worse. How fast do you think the guy running in shorts ran right out of that gym? I don’t care what you think, to me this is commitment. 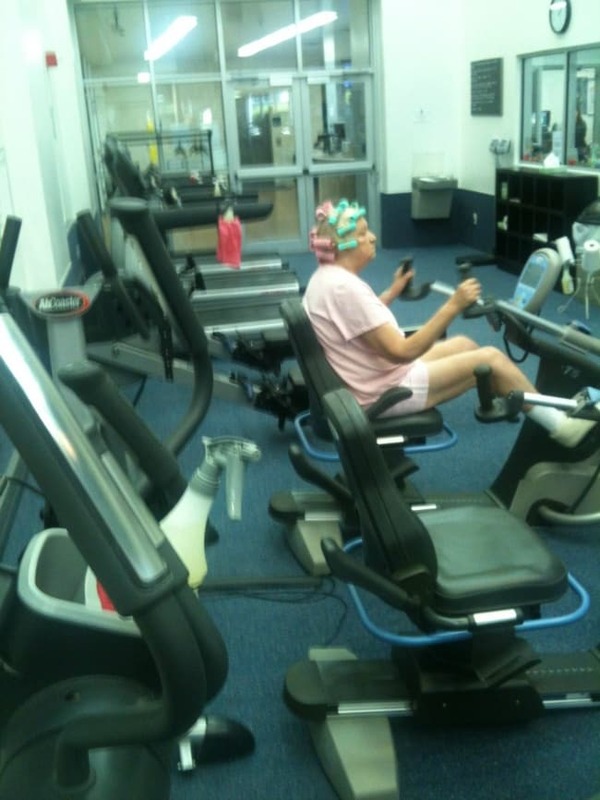 Rollers in her hair, pink shorts and shirt, and a look of determination. I hope this is me one day, but I think most of us already have the same outfit, hair rollers and facial expression, but we use it while we’re watching television on the couch. What’s happening here, guys? 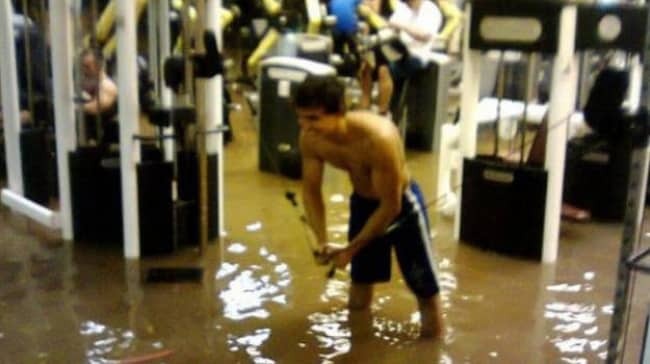 It’s not just this one young man pumping iron in knee-high dirty water. It’s a whole gym full of guys seemingly unconcerned about the water that is rapidly surrounding them and their machines. We assume this was happening during a hurricane or some other natural disaster that they really should’ve evacuated from – who won the award for “toughest dude during a natural disaster”? I hope he got a trophy. 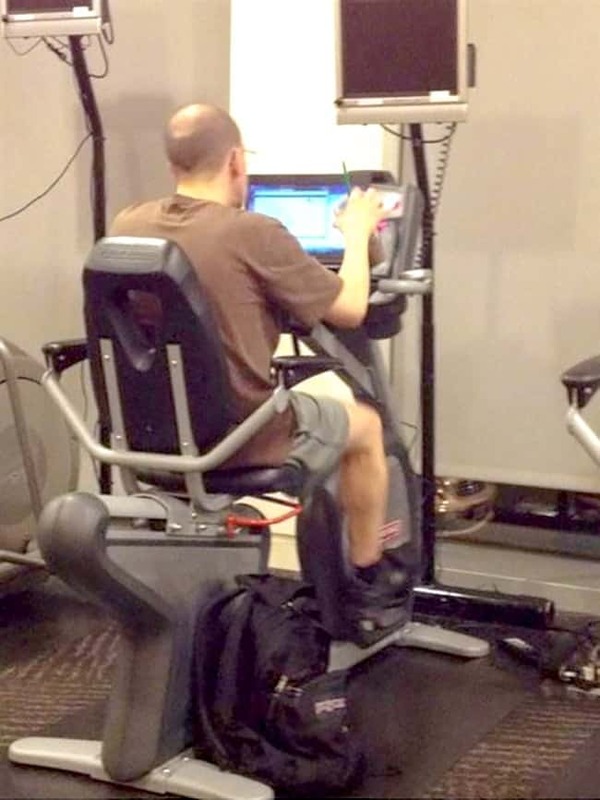 Most of us have felt dumb at the gym, wondering if we were using the machine right. 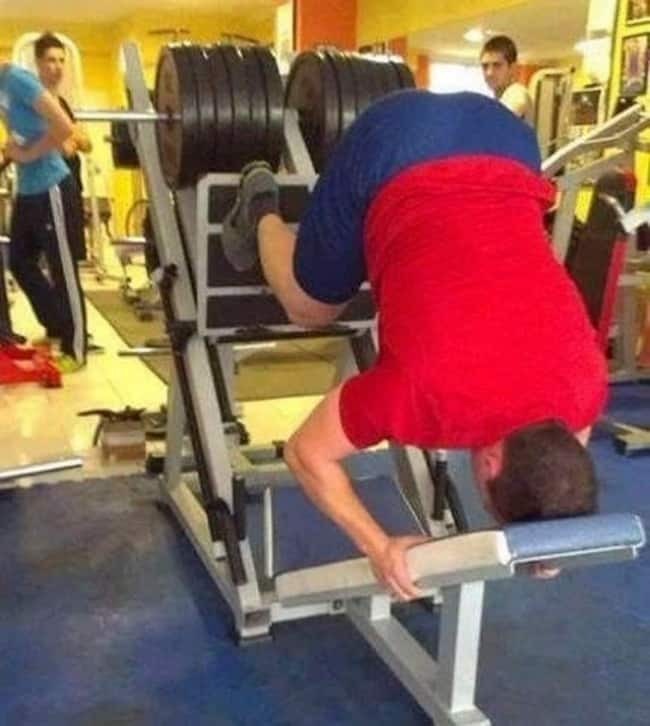 As mortifying as it would be to have someone correct your form, I sincerely hope that someone quickly ran over to this gentleman and said “sir, you are doing it wrong!” Also, guys, please stop using your head to do the leg machines. Honestly, I have nothing snarky to say about this photograph. Was he alright? Did he break his neck? Did he ever speak again? Did he make it to the hospital in time? Did he need plastic surgery? 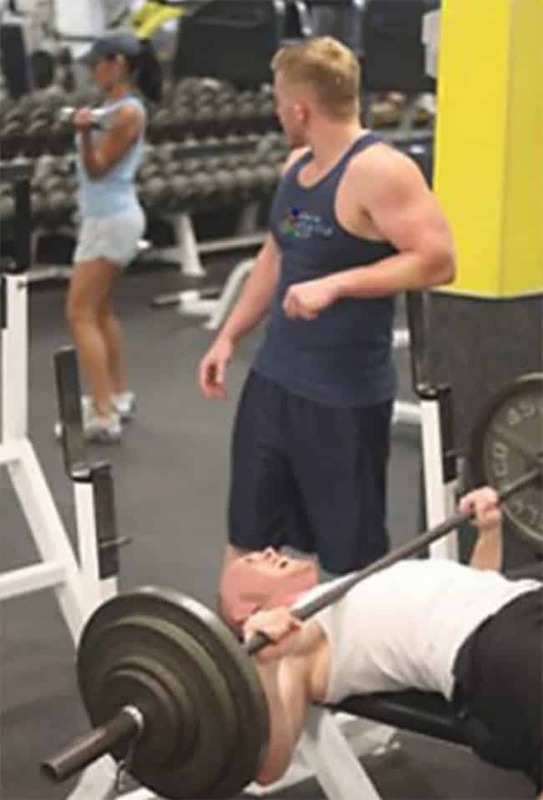 Was he too tough for a spotter? Did he ever return to the gym? You’re a couple and you enjoy working out together. Ok, fine. 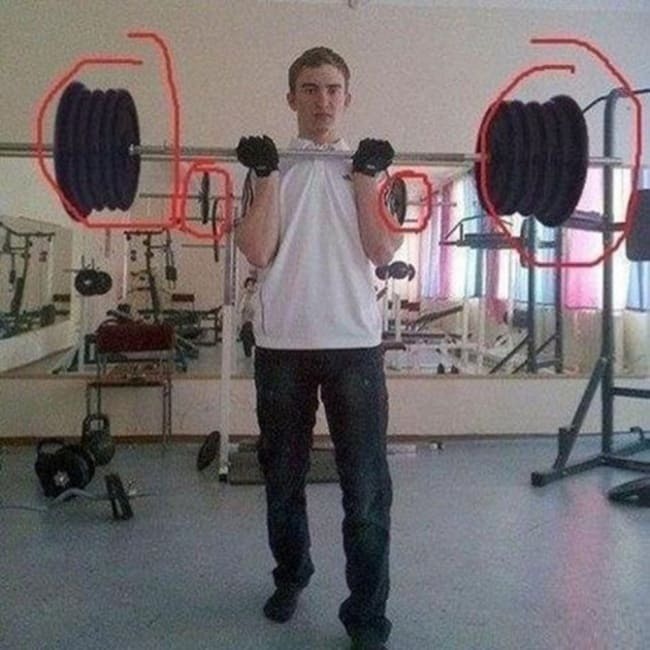 In addition to how this looks, the biggest problem with this picture is that they think this is helping him lift more weight. Is it, though? 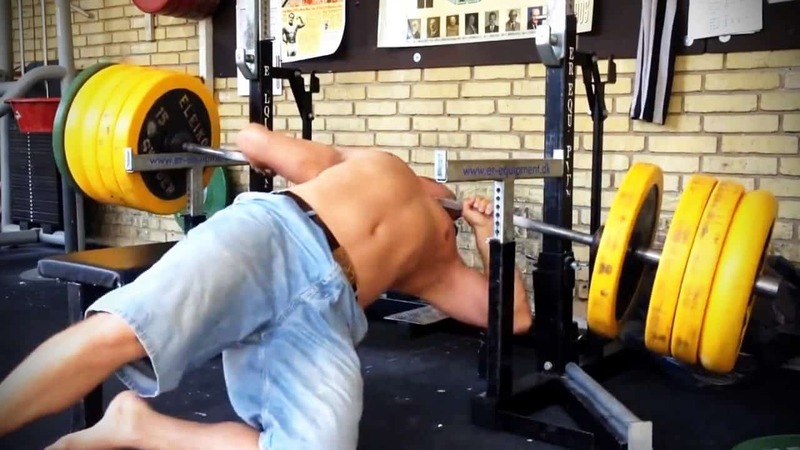 Is this the safest and most effective way to bench press? You usually see just about anything at the gym, from suits to bare feet. However, this is an unusual outfit. There’s a leotard that doesn’t fit – or maybe it’s a swimsuit. Then there are some gym pants that make this seem a lot more sordid than it ought to be. In this photograph there’s not one but two guys who have no idea what they’re doing! 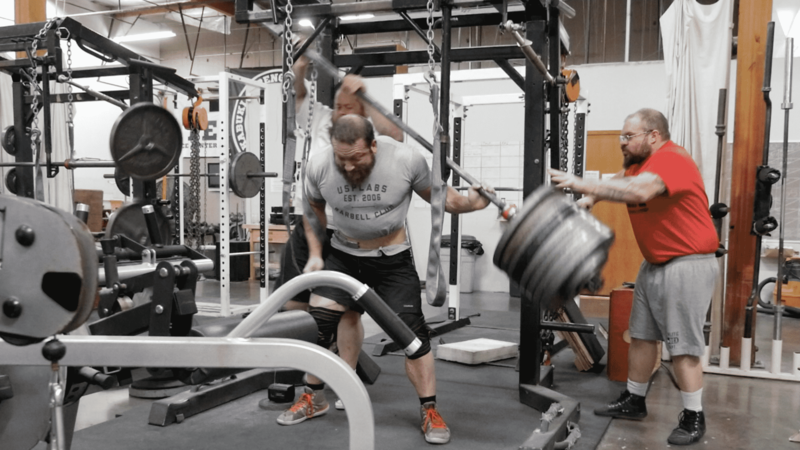 The amount of weight on the bar is completely absurd. There’s no shame in lifting with less weight. Especially when both these guys combined can’t manage to lift even half of what is on that bar. The setup here was great, he thought. He had on his special lifting gloves. He also had a face that showed lots of consternation. If you look closer, however, you’ll see what this guy actually did. He went home and photoshopped this to make it look like he lifted lots of weight. Just take a peek in the mirror behind him! 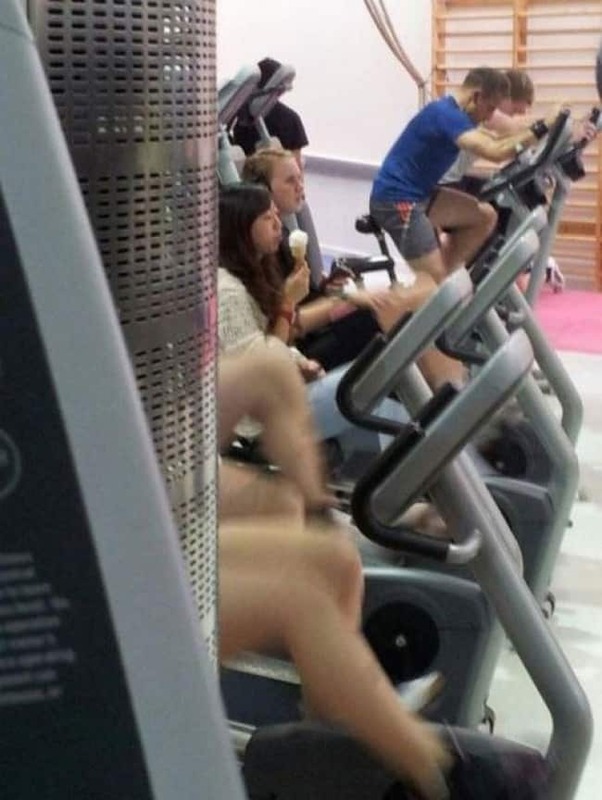 The good news is that she is so committed to the gym that she apparently went straight from the cocktail party to get her pump on… while wearing pumps. (Nice handbag by the way!) The bad news is that whoever she went out with that night made her mad enough to hit the gym right away!